Henrik Lundqvist, 29 years old is a famous name in the field of Hockey. He plays for the New York Rangers Hockey team. To know more about his biography and profile, check this Henrik Lundqvist wiki article. 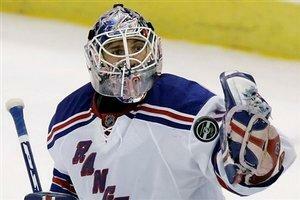 Henrik Lundqvist, born on the 2nd of March 1982 is a professional Swedish Hockey player. He not only plays for his team, the New York Rangers but also for his Country Sweden. Sweden is proud of Henrik Lundqvist as he twice brought Gold for his country and Twice Silver in the World Championships. As for his team he is named as Rangers "most valuable player" for the fifth consecutive season by the Professional Hockey Writers' Association. He is the first player in the Rangers to earn the Rangers MVP award five consecutive times. Lundqvist began playing Hockey at a very young age. His professional career mainly began when he was drafted by the New York rangers in the year 2000. As for now he had developed as one of the top goaltenders in the league. It was after that when he went to play with the Frolunda HC of the Swedish Elitserien where he won two titles in the respective years 2003 and 2005. He joined the Rangers in the year 2005 after the lockout and won the starting job quickly. He won 20 of 54 starts in his rookie year and posted a 2.24 GAA. He was also nominated for the Vezina Troph not only once but for consecutive three years. Henrik played for Team Sweden in a number of competetions in the international sphere. He played for the 2006 Winter Olympics and brought Gold for his country and himself. In 2002 also he won gold in the Inline Hockey World Championships. In 2003 and 2004 he won two silver Medals in the World Championships. In the year 2008, on 24th February 2008, Lundqvist became the first Rangers goaltender to make a record of eight shutouts in a single season. Breaking the record he again made the record of a nine shutouts in one of his next matches. In February 2011, Lundqvist earned his 200th NHL win in a 4-3 shootout victory over the Los Angeles and on the 19th of March, he became the first NHL goalie to win 30+ games in his first six seasons.